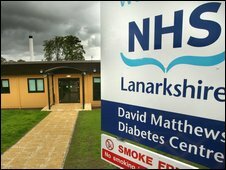 A new centre for diabetes patients, named after one of Scotland's leading experts on the condition, has opened in Lanarkshire. Health Secretary Nicola Sturgeon visited the David Matthews Diabetes Centre at Monklands hospital in Airdrie for the official ceremony. The facility brings all diabetes services, including dietetics and podiatry, together under one roof. Dr Matthews died last year but his wife and children attended the opening. The doctor had worked at Monklands for more than 20 years and as well as helping set up the Lanarkshire Diabetes Group, he also developed an IT system for diabetes care that is now used by health boards across Scotland. Diabetes occurs because the body cannot use glucose properly, either due to a lack of the hormone insulin, or because the insulin available does not work effectively. The new centre will handle 6,000 consultations a year and will run education and support programmes for people with the condition. Dr Matthews' wife Allyson said: "I wanted to be here today to thank everyone who decided to honour my husband by naming the centre after him. "I am immensely proud but I think he deserved it. He was a great physician and teacher and very much for the kind of teamwork the centre is part of. "He did not like the words 'empowering' and 'counselling' because they just came naturally to him, but he was very good at that kind of thing." Health Secretary Nicola Sturgeon said: "It is important for me to open a centre like this because it is named after someone who made an enormous contribution to diabetes care in Scotland. "Dr David Matthews was a pioneer who played a big part in some of the advances in this area in recent years. She added: "We live in tight financial times and its important to get better value for money. "Projects like this demonstrate that there is huge investment in the NHS in Scotland, in new and modern facilities. "At the same time, through good centres like this we can actually save money because by treating patients here, and enabling them to better manage there own care, then there is less chance of them being admitted to hospital with complications."